A Sixth Rate on the Stocks, John Cleveley, 1758, National Maritime Museum. 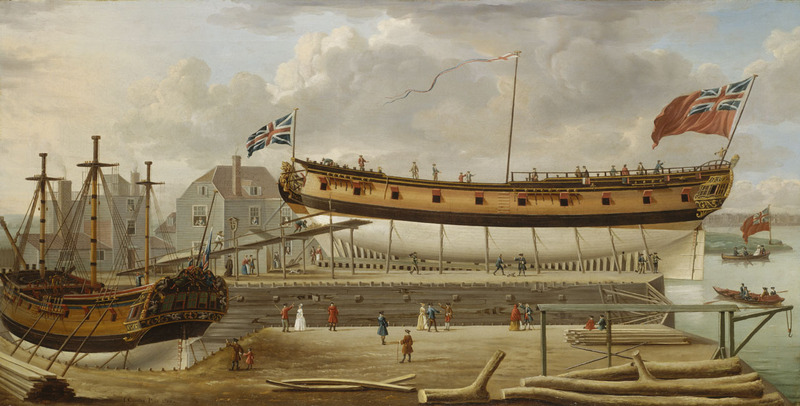 The centerpiece of this painting is a brand new sixth rate frigate, pierced for 20 guns on her gundeck, and eight more on her quarter. These were fast vessels, and the most likely to take a prize. Frigates could also act as tenders to the gargantuan ships of the line that fought in the major fleet engagements throughout the century. On her larboard bow is another vessel, this one in stocks and already launched. We can tell she has been launched because she has her masts fitted and rigged, something that would not occur prior to launching. There are a few sailors scattered about, though some may be dockworkers, shipwrights, and the like. The line between these occupations is a thin one, and permeable, but we should approach this painting with caution nonetheless. It is also worth noting that the resolution on this copy is not terribly high. I will do my best to zoom in on the details, but they will be sketchy at best. There is a small crowd of gentlemen and ladies looking on at the impressive vessels. In the upper left of this detail, we can see a sailor taking the time to talk about the sixth rate with a lady in a white dress. He wears a red jacket that ends below the waist with a single vent at the back. His cuffs are slashed, and he wears a black cocked hat and plain trousers. On the same level but to the right stand a pair of men with a lady in a yellow dress. I am less positive about their identities, but they both wears jackets and carry sticks. It is the jackets that set them apart. Some of the gentlemen around this detail carry walking sticks, but they do not tuck them under their arms. At that, the caped overcoats worn by a pair of gentlemen suggest a season that would be unsuitable for jackets, which are unfashionable in the higher circles anyway. 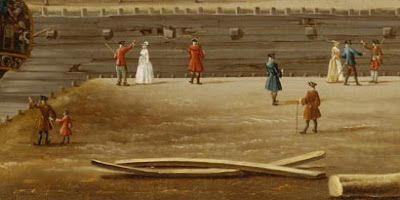 If indeed these men are sailors, we can say that they wear blue and brown jackets, brown and red breeches respectively. Both have black cocked hats. 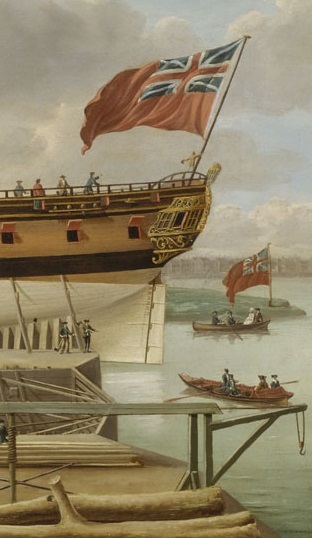 The details in this image are scant, and I cannot even be sure of the clothing worn by the bargemen below the sixth rate's stern. If you have access to a higher resolution copy of this image, I would be much obliged!